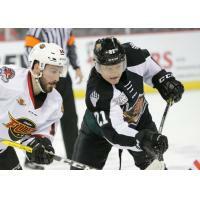 Cincinnati, Ohio - The Utah Grizzlies are in the Queen City as they take on the Cincinnati Cyclones in a battle of first place teams on Wednesday night at US Bank Arena. The Grizzlies are tied for first place in the Mountain Division with the Tulsa Oilers as both teams have 44 standings points on the year. The Cyclones are in first place in the Central Division with 50 standings points and a record of 14-1-2-1 at home this season. 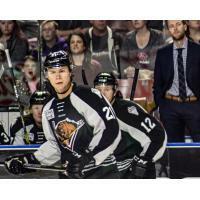 Austin Carroll has been outstanding for the Grizzlies since coming back to Utah after a 4 week stint in the AHL. Carroll has 4 goals and 2 assists in his last 4 games. Jack Walker has a 3 game goal scoring streak, including a thrilling game winning goal in overtime to complete a 3 game sweep of the Wichita Thunder last Saturday night. Tim McGauley has been good lately as he has 2 goals and 2 assists in his last 3 games. It's a meeting between 2 really good defensive teams. Cincinnati leads the league by allowing only 81 goals on the season. The Grizzlies are 2nd by allowing only 85 goals. Both teams have outstanding goaltenders. Cyclones goalie Michael Houser is tied for the league lead with a .937 save percentage. Utah goaltender Joe Cannata leads the league with 4 shutouts and Kevin Carr won 3 games for the Grizzlies last week vs Wichita. Carr currently has a record of 11-2-1 on the year. Wednesday night begins a 3 game, 3 city, 4 day road trip to the eastern time zone. On Friday night the Grizzlies are at the Wheeling Nailers and Saturday they are in Fort Wayne to play the Komets. Tonight's broadcast can be heard on ESPN 700/ECHL.TV. 5:35 pm face-off mountain time, 7:35 pm local start in Cincinnati. Grizzlies notes: Forward Ryan Misiak was traded to the Idaho Steelheads on Monday to complete a future considerations deal that was originally with the Florida Everblades in a deal that brought forward Matt Berry to Utah. Misiak had 18 goals and 43 assists in 135 games in a Grizzlies uniform in 3 seasons and 2 different stints with the club. The Cyclones are tied for the league lead with a 86.3 percent penalty kill. Cincinnati features 3 former Grizzlies players on their current roster. Defenseman Mitch Jones and forward Nate Mitton each played for Utah in the 2017-18 season. Forward Eric Knodel played in 56 games for the Grizzlies in the 2015-16 season. Watch out for the 3rd period in tonight's game. Cincinnati has outscored opponents 42-18 in the 3rd periods, while the Grizzlies have been outscored 30-29 in the final frame of regulation. Cincinnati is tied for the league lead by averaging 3.79 goals per game and they also lead the league by allowing only 2.38 goals per game. It's going to be a good test for the Grizzlies in the only regular season meeting between the 2 teams.